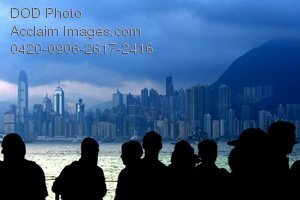 Description: Free, public domain image: Sailors Aboard the USS Ronald Reagan Watch as They Approach Hong Kong. HONG KONG (Jun. 19, 2008) Sailors gather in a hangar bay aboard the aircraft carrier USS Ronald Reagan (CVN 76) as the ship approaches Hong Kong for a port visit. The Ronald Reagan Carrier Strike Group is on a routine deployment in the U.S. 7th Fleet area of responsibility operating in the western Pacific and Indian oceans. U.S. Navy photo by Senior Chief Mass Communication Specialist Spike Call.